Pollard, Will Rogers, Charlie Chase, Edgar Kennedy, Laurel and Hardy, Our Gang, Thelma Todd and ZaSu Pitts, and others; TV producer, with his son, after World War II: company finally dissolved, 1962. Awards: Academy Award for Bored of Education , 1936; Special Academy Award, 1983. Died: 2 November 1992. "The Gag's the Thing," in Popular Mechanics (Chicago), May 1935. "Living with Laughter," in Films and Filming (London), October 1964. The Silent Picture (London), Spring 1970. In Hollywood Speaks! An Oral History , by Mike Steen, New York, 1974. "Golden Silents," in Time Out (London), 20 November 1991. Everson, William K., The Films of Hal Roach , New York, 1970. Sight and Sound (London), Autumn 1964. Rosenberg, Bernard, and Harry Silverstein, in The Real Tinsel , New York, 1970. "Hal Roach on Laurel & Hardy," in Pratfall , no. 1, 1972. Classic Images (Indiana, Pennsylvania), July 1983. "Hal Roach Studios," in Pratfall , no. 2, 1985. Bann, R.H., "Hal Roach: A Legendary Producer's Beverly Hills Estate," in Architectural Digest (Los Angeles), April 1990. Facts on File , 5 November 1992. Obituary in The New York Times , 3 November 1992. Obituary in Variety (New York), 9 November 1992. Obituary in Sight and Sound (London), February 1993. "Hal Roach," in Films in Review (New York), September-October and November-December 1993. Hogue, P., "Charley with a Y," in Film Comment , March/April 1995. "10 Years Ago," in Forbes , 10 February 1997. Hal Roach was a producer and motion picture executive best remembered for two things. First, he helped create one of the great comedy factories of all time. In the 1920s his studio launched the careers of Laurel and Hardy, and fostered the talents of Harold Lloyd, one of the serious rivals to Charlie Chaplin, and Buster Keaton. The Roach comedy factory produced many of the best-remembered short subjects of the 1930s, including the Our Gang comedies which continue to grind away on television some 60 years after their creation. By the 1920s Hal Roach had become an established producer, and his comedies had begun to rival the then "King of Comedy," Mack Sennett. Roach smoothly survived the transition to sound, but Sennett did not. Thus, by the mid-1930s it was Roach, distributing through the then dominant major studio, MGM, who could properly be labeled the "King of Comedy." The Our Gang series, the teaming of Laurel and Hardy, and the comedies of Charlie Chase made Roach into a powerful, respected producer of comedy shorts. But Roach did not neglect the talent behind the camera. Indeed his studio helped foster the careers of George Stevens and Leo McCarey, both of whom would move on to become major directors. The Great Depression served as the Golden Age for the Roach comedy factory. 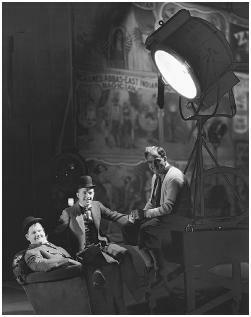 Unfortunately the studio could not develop any stars to rival "Our Gang" and Laurel and Hardy. By 1935 the Roach studio was on the decline as the major studios squeezed them out by creating more and more double features and less and less non-animated shorts subjects. In 1938 Roach sold "Our Gang" to MGM and moved on to try independent feature filmmaking with United Artists. Roach did as well as any producer at United Artists in the late 1930s and 1940s. It was hard to lose money during the Second World War boom era. Between 1938 and 1941 Roach tendered 14 films through United Artists, including Topper Takes a Trip starring Constance Bennett and Billie Burke, Of Mice and Men starring Lon Chaney, Jr. and Burgess Meredith, and Saps at Sea starring an aging Laurel and Hardy. But a military career creating training films ended what success he had with these low-budget films. In a less well-known, but equally important contribution, Roach pushed the film industry into the television production business. For example, he set up an early series called Screen Director's Playhouse on which such talents as Leo McCarey, John Ford, and Tay Garnett worked. Unfortunately little came of its efforts in long-term monetary gain. Thus though Fireside Theatre was turned out in quickie fashion at Roach studio for NBC in the late 1940s and early 1950s, the Roaches, Senior and Junior, could not create a permanent relationship with the network. Their greatest success came with a comedy show Roach Junior did with Gale Storm called My Little Margie which aired from 1952 to 1955 and many more years in syndication. Hal Roach, Sr. pioneered with television but not well enough to prevent his studio from going bankrupt in 1959 and providing him with an ungraceful retirement. There is a new book about Hal Roach: "100 Years of Brodies With Hal Roach" by Craig Calman, BearManor Media 2014. Most of the film library was bought in 1971 by a Canadian company that adopted the "Hal Roach Studios" name. It primarily handled the business of keeping the library in the public eye and licensing products based upon the classic film series.